The contrast between the neat appearance of this partly C18th building now, and how photos showed it to have looked two or three years ago, was indication in itself that some laudable work had been carried out. A visit inside was however needed to show the full extent of the achievement. What really made this project stand out was that it included the rescue of some remarkable C18th plasterwork within the building’s main room, now the guest house dining room. How this elaborate decoration, on both ceiling and walls, came to be there is a mystery, but there was no doubting the chronic condition which the years in which the former pub was empty had left it. 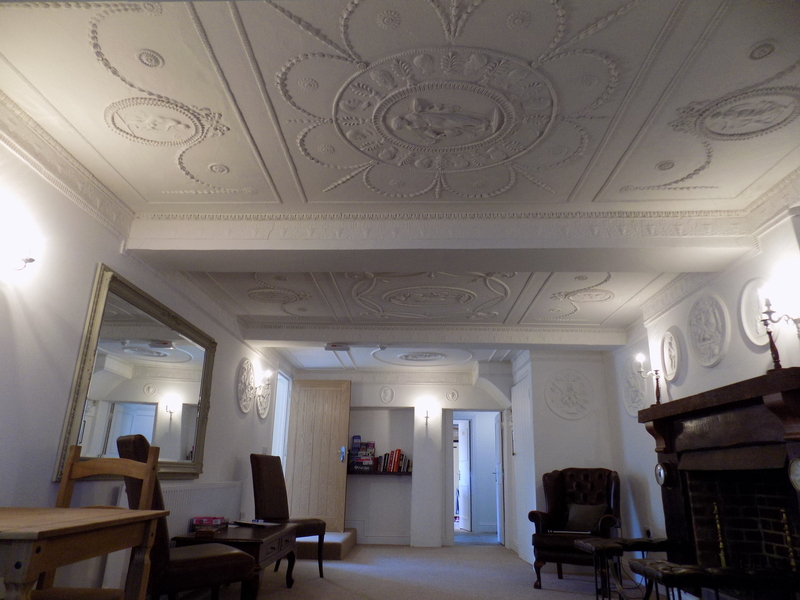 The recreation of some areas of collapsed ceiling plasterwork from scratch, coupled with the repair and conservation of surviving plaster elements, had clearly been carried out with dedication and skill. The result of the project was an attractive guest house whose great feature is a carefully restored and highly unusual dining room, and the commitment put in to retaining the full character of a very prominent building, which in other circumstances might have been permanently degraded, clearly deserved an award.